Just as a note to my readers out there, this post is a bit longer than usual, so it is split into two parts. You are now reading Part 2. Make sure to have read Part 1 before reading this second part. Let [the governments] in these troublous times be more than usually cautious in attempting real ameliorations, not imperatively claimed by the needs of the moment, to the end that good itself may not turn against them - which is the case whenever a Government measure seems to be inspired by fear. Let them not confound concessions made to parties with the good they ought to do for their people, in modifying, according to their recognized needs, such branches of the administration as require it. Let them give minute attention to the financial state of their kingdoms, so that their people may enjoy, by the reduction of public burdens, the real, not imaginary, benefits of a state of peace. 1C. Of which 19th-century ideology is the excerpt most representative? Explanation: Conservatism was an ideology that sought to preserve the current status quo of European politics and society. In order to accomplish this, Conservative advocates frequently fought any attempts to change society. In other words, conservatives were adamant on social, economical and political change. Let them be just, but strong; beneficent, but strict. Let them maintain religious principles in all their purity, and not allow the faith to be attacked and morality interpreted according to the social contract or the visions of foolish sectarians. Let them suppress secret societies, that gangrene of society. Nonetheless, if you had a difficult time understanding the passage, fear not, as there is one more clue you could use to solve the question. It's simple: Look at the author's name ! Klemens von Metternich. Metternich was an Austrian diplomat whose policies dominated Europe for the first half of the 19th century. Metternich was the poster child for conservatism, as not only this he urged other countries to stick to conservatism, but frequently crushed any form of revolution (as it posed a serious threat to conservatism), whether it was in present day Italy or the Austrian empire itself. A) French Revolution and Napoleonic Wars. B) French Wars of Religion and War of Austrian Succession. C) Thirty Years’ War and Seven Years’ War. D) English Civil War and Spanish Netherlands Revolt. Explanation: The French revolution frightened Europe as it witnessed one of the great powers collapse into chaos. With members, supporters and alleged supporters of the Bourbon dynasty decapitated (guillotine) left and right, other European monarchs were scared that the same might occur to them. Even after the revolution ended and Napoleon came to power, Napoleon nearly brought all of Europe to her knees by defeating other continental powers in Europe. After Napoleon was finally defeated, the Congress of Vienna attempted to place countermeasures to avoid such a thing, regardless if its an ambitious country or revolution, from occurring again. To successfully answer this question, you have to orient yourself time wise. If we focus our attention to when the passage was written, we can see that it was in 1820. B, C and D either take place in the 17th or 18th century, and despite all of these events taking place in Europe, they were fought for different reason. B and D were fought in the name of religion. D was fought over English politics and freeing the Dutch from Spanish control. Metternich is not concerned about religion nor is he concerned with power succession. Instead, Metternich seeks to keep to current order functioning. Answer A was this only option at the time that would get in the way of disrupting conservative values. A) governments responded to the problems created by industrialization by expanding their functions. B) Austrian nationalists encouraged loyalty to the nation through liberal reform and political unification. C) mass-based political parties emerged as sophisticated vehicles for social and political reform. D) the Concert of Europe sought to maintain the status quo through collective action. Explanation: The excerpt provided by Metternich argues in favor of conservative policies. As a result, Metternich seeks to maintain the status quo by keeping the current order functioning and immune to change. To pursue conservative policies in this context means to avoid any radical change, albeit inspired by liberalism or nationalism. In addition, Metternich believed that the best method to maintain the current order was if all European nations followed the same collective policies. In short, the attempt to keep to current balance of power in Europe was known as the Concert of Europe. Remember (in reference to this class) that not too long ago Europe experienced the First French Revolution (yes, there are more than one) and an overly ambitious France (aka, Napoleon). Revolution in itself is extremely contagious. Once revolution brought down a powerful dynasty in France, it had leaders from other European countries wondering: "Could it happen to us?" Likewise, people from other European countries wondered if it was possible to change or even topple their own government. With Revolution, things can get extremely messy and chaotic, thus throwing a delicate order into total disarray. Furthermore, France had someone like Napoleon rise to power and nearly bring all of Europe onto her knees. Once again, one country ruling above all other countries disrupts the scales of balance. With that being said, people like Metternich refused to experience such events ever again. He believed that the best way to protect the Austrian Empire was to prevent her from changing. Past experiences have shown that uncontrolled change has not worked in the Austrians' favor. For example, Marie Antoinette (Queen of France, Wife of Louis the 16th, and an Austrian princess) was decapitated during the French revolution. The Austrian empire herself was militarily humiliated by a significantly smaller French army (Battle of Auschwitz). Therefore, one could say that Metternich's policies were reactionary. The other options to this questions involve some kind of change, whether it is industrialization and increasing current government functions (A), promote liberal policies (B) or advocate for political and social reform (C). All of these options essentially offer was Metternich's policies for Europe strived to stray away from. A) passage of legislation to protect labor unions. B) passage of legislation to prohibit radical political gatherings. C) restoration of hereditary monarchs. D) issuance of decrees that abolished nationalist groups. Explanation: Conservatism was an 19th century ideology that sought to maintain the status quo and opposed any kind of change, as change would disrupt the delicate balance of power in Europe. This question is a classic "which does NOT belong?" type question. As previously established, this passage calls for Europe to maintain its conservative policies. Thus, we must select the question that does NOT promote conservatism. To begin with, A does not promote conservatism as calls for legislative reform in labor. Change and reform are red flags when it comes to conservatism. Because of that, let's keep that answer for now. B prohibits radical political gathering. Radical political gatherings are something that would certainly disturb the current status quo, as they promote radical change within the government. Prohibiting such activity would definitely work in favor of conservatism, but given that the question asks for the answer that does NOT support conservatism, we cross B out. C says to restore hereditary monarchies. This would be a return to an old order that was easier to maintain. Again, this promotes conservatism, so we shall cross this answer off. This leaves us with D, which banishes nationalist groups. Nationalism and conservatism mix as well as water and oil. And alas, we are left with A. Time to move on to the next question! Want more practice? Click the book cover above to buy an eBook of 55 multiple choice questions for AP Euro on Amazon with similar topic ratios as the exam to prepare for test day. Even at permitted popular assemblies and popular festivals, it should not be tolerated that public speeches with political content are held; those who are guilty of this are to be forcefully punished, and whoever abuses any popular assembly in order to propose addresses or resolutions and have them approved by signature or oral consent is to have more severe punishment imposed on them…. 6. The Confederal governments will have continuously provided the most exacting police surveillance on all local residents who have made known – through public speeches, writings, or actions – their activities or participation in seditious plans; …they will provide reciprocal support about all discoveries of subversive secret associations and the individuals involved in them, including following up on evidence in these cases. A) socialists’ attempts to introduce alternative systems of economic distribution. B) nationalists’ attempts to unify those of German ethnicity into one political entity. C) conservatives’ attempts to restore traditional monarchies after the Napoleonic Wars. D) revolutionaries’ attempts to destroy the status quo in neighboring states. 4B. Which of the following is LEAST similar to the purpose of the excerpt? All of the answers can be found in the passage. In fact, let's break it down together to see which answer is least likely to fit within the context of the passage. In other words, people cannot freely assemble. They have to get permission from some local authority. A seems to describe this, so we can cross that out. Although the passage does not explicitly talk about forbidding civilians from receiving military training, just stop and think about it. With a proposed government model (such as the one above) that strongly supports constant surveillance, limited assemblies and severe punishments for crimes, one can see that this document proposes to keep it's people on a tight leash. However, it is not that the passage seeks to actively harm people. Instead, the passage seeks to establish a strong, united nation, even if it means to restrict some rights. So if the German government wants to keep internal conflict at a minimum, then it would make sense to prohibit civilians (not that I'm agreeing with this) from receiving military training. Such training could perhaps give rise to well trained rebels and rebellion is the very thing this passage seeks to eliminate. Based on the reasoning that this passage restricts civilians' rights, it would also make sense that government officials give themselves more power to keep its people under control. Since D is the only answer left, we circle D and move on to the next question. In addition, it is worth noting that lowering the voting age would be a threat to the German government as it essentially allows more room for newer (perhaps liberal?) ideas, which again, threatens the stability of Germany. Despite not covering him in the review session, I believe that this man is worth discussing. For essentially the first half of the 19th century, we see Metternich based policies ruling the continent. Nevertheless, it would be Bismarck changing the game for the second half. Bismarck was a Prussian statesman that played a crucial role in the creation of Germany. A quick google search would show that Bismarck based his policies on conservative ideology. This is true. But you would also see that he advocated German nationalism. Metternich, a conservative diplomat, frequently went out of his way to put down rebellions and revolutions. He found nationalism to be a threat to the Austrian empire and Europe as well. How can Bismarck, a conservative statesman, praise nationalism? Well, Bismarck was also a profound believer in Realpolitik. Realpolitik is form of diplomacy that basis itself on factors and circumstances instead of ideology. Rather than sticking to some political ideology, realpolitik is pragmatic. Bismarck realized that nationalism could be a tool to unite the scattered German states and form one strong state. But he did not stop there. Bismarck saw that through war Germany could expand her borders and mark herself as a great power on Europe. 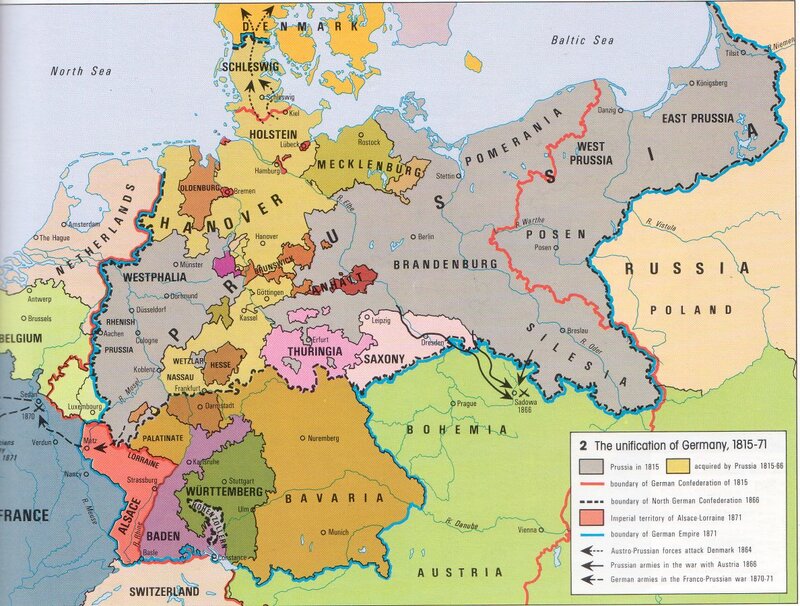 Through the Franco-Prussian war (where Germany gained the Alsace Lorraine, an area filled with valuable resources) and the Austro-Prussian War, Germany successfully established itself a power not to be trifled with. Bismarck quickly realized that war between European countries was inevitable. Britain and France were wary of Germany, and soon there began an arms race between Germany and Britain. Although Bismarck was confident in securing Austria's aid in a time of war (Dual Alliance of 1879. Although Austria-Hungary was resentful of Germany and her methods, Austria-Hungary hated the Russians even more), Bismarck also wanted to avoid to have a two front war (France and Britain on the West, Russia on the East), as Germany had enemies on both sides. Ultimately, Bismarck chose to sign a treaty with Russia. Should war break out, Germany, Austria and Russia would be fighting as a united unit. Or at least, theoretically. Keep in mind, despite Bismarck's best efforts, Russia and Austria had an extremely fragile alliance (hint: they will fight each other in WW1). Not even Bismarck's elaborate house of cards could withstand the death of Archduke Franz Ferdinand.